Since getting my two Barnevelders, Hannah Hen has loved spending each and every day with the new girls. She toddles off each evening about 5:15 to wherever it is that she sleeps and appears back at the coop to greet the girls the next morning. She is tolerated and she is the boss, even though she is only a bantam and much smaller than the young barnies. She has experience on her side. She is about four years old and they are only five months. SInce Hannah Hen turned up at our house many months ago, I have never been able to work out where she sleeps. Until two weekends ago. About 5:15, as per her usual bedtime, she leaves the barnies and furtively walks into my garden and hides in there for a while. I have never noticed her come out the other side of the garden and had been starting to wonder if she slept somewhere in that garden – until two weekends ago. I saw her make her way slowly out the other side of the garden. Then she made her way across the lawn. Over to the shelter of the next garden. Then she turned left and wandered along the edge of the garden, disappeared down the bank and into the toi tois and manuka. I sneaked up behind her to find out where she went next. I got such a surprise. I actually thought that she would be sleeping in amongst the bushes in my garden. But no! She flew, yes flew, over the toi tois and the manuka, onto the road. Wandered across the road, under the neighbour / friend / farmer’s gate on the other side of the road and disappeared under the wooden stockyards. So that is where she sleeps! That was a few weekends ago. She had been coming over later and later in the mornings until last week when she turned up just before lunch and left after a quick meal. She didn’t seem interested in looking for the barnies who were in the bush quite near and I haven’t seen her since. She was making strange noises that day and my brother who was visiting (and who has lots of chooks) said she sounded as though she was broody. So Hannah Hen is being all mysterious again. What this has proved to me is, Hannah Hen isn’t mine. She is a free spirit. Maybe she knew I was in the process of buying another coop and was going to catch her and put her in for a week to get her used to sleeping at our place. That way I could say she is mine and I could keep her safe at nights. Categories: Hannah Hen | Tags: Chickens, Chooks, Hens | Permalink. Each morning before I go to work I sneak out to the chicken coop in the (almost) dark (still winter in New Zealand) to open the door so the girls can free range all day. By the time we get home each evening the sun has gone down, the chooks have put themselves to bed and I shut their door to keep them safe. This night however, we got home early and expected to see both Helen and Hilda Hen eating their last fill of fresh grass just outside their coop as they normally do before putting themselves to bed. But this night something is very wrong. Helen Hen was where I expected her to be but she was on her own and looking anxious. (I didn’t expect to see Hannah as she goes to bed early.) Since getting Helen and Hilda Hen, they have never been more than a short distance apart even though they have such a huge area to roam. If one wanders too far, the other always notices and runs full tilt towards the other (sometimes with wing action). So I anxiously called (here chook, chook, chook) and listened for Hilda’s answering chatter, but nothing. I sat with Helen and fed her grain while Haitch looked along the bush line for Hilda. I realised that Hilda was definitely not going to turn up so I thought I had better look a little further afield for her. I walked down the path that goes down into the bush where they spend a lot of their day and peered through the trees and called again. Nothing. Then I walked further into the bush and down the steep hill and called again. This time Hilda answered my call. She was clucking very very loudly and sounding distressed. She was making the sound hens make after laying an egg but I knew that this was a distress call, not an egg laying call. It was dusk, she was a very long way from her coop in an area that is very difficult to get to, and she was on her own. No wonder she was distressed. To get to where she was calling from I ran further down the steep hill dodging trees and sticking out branches as I went, I slid down a bank so steep I had to slide down on my bottom and then ran over to where I had heard her. I couldn’t see anything as the bush on this part of our land is very thick and drops down quite steeply. I dare not go any further in case I too disappear into a place of no return. I called again (trying to keep my voice calm) and she started clucking loudly again. I couldn’t get to where she was so I pulled myself back up the steep bank and then ran back up the hill through the bush to get Haitch. On the way back down the hill, we heard a loud clucking from near the coop. Maybe she had found her way back up the hill while I was inside. So I went back up the hill hoping to see both girls but no, Helen was there looking afraid and alone, so I guess the loud clucking was her answering Hilda’s distress call. I popped her in the coop and shut the door so I didn’t end up with two lost chooks. I picked up the bowl of grain that I had been feeding Helen with, hoping it may help me get Hilda back. I ran back down the hill, slid quickly back down the steep bank without any thought to my own safety (a bit like a mad mother hen I guess, protecting her chicks). I called out to her again and this time she sounded a little closer. I kept calling and she kept answering. Then I saw her gingerly picking her way over the top of a very steep bank that was covered in thick fern and other bush debris. She slowly made her way towards me stepping cautiously and very slowly. She finally got over all the debris and ferns and was able to make her way to me but on the other side of a wooden fence (where a neighbours dog roams free who likes to chase chickens). Hilda just stood there looking at me, dazed, hungry and exhausted. Although my chooks are friendly (especially Hilda) and are happy to take food from a hand held bowl and sometimes out of my hand, they are still new and I have never picked them up. So I couldn’t climb the fence and grab her as she might get a fright and run off again. To her left was the place of no return she had just returned from and to her right was probably the dog lurking somewhere. And she was just standing there looking at me and chattering quietly. Then I remembered the bowl of grain. I leaned over the fence and held it towards her so she could see what was in it. She took a few slow steps towards the bowl. I let her take a few pecks. Then I put the bowl on my side of the fence. She moved closer to the fence and jumped up onto the bottom rail. I held out the bowl and she started pecking. I reached my hand underneath her and picked her up. I expected a flapping of wings and a struggle but there was no fuss. She almost seemed relieved and settled in against me as I carried her all the way back to her coop where her sister was anxiously waiting. I have no idea how she got down there or why. Maybe she got too close to the neighbours fence and the dog may have frightened her. Either that or she was being very adventurous or stupid. I guess that is the chance I have to take when I free range my chooks while I am at work all day. Categories: Hilda Hen | Tags: Chickens, Chooks, Hens | Permalink. The chooks must have gone into the bush. The bush is one of their favourite places to scratch and peck. This is the path that leads down into the bush. I’ll take a wander down to see if I can see them. I look to the left. No chooks to be seen. I can see where they have been scratching and lying in the dirt. I look to the right. No chooks to be seen. Aha, there they are. Can you see the black shape in the middle of the picture below? Scratching and pecking is what we do. 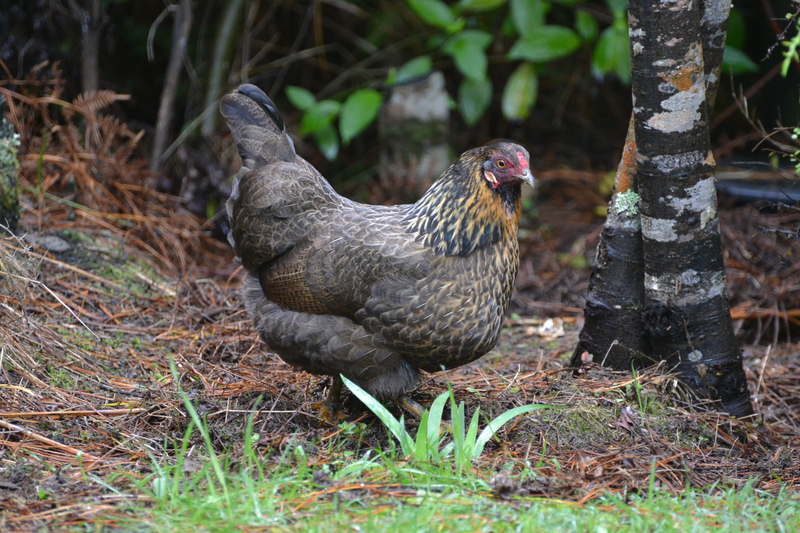 Categories: Chooks | Tags: Bush, Chickens, Chooks, Hens, New Zealand | Permalink. Beat the rats – out with the compost bin and in with the worm farm. I checked out the worm farms that are available and ended up with the Australian made Can O Worms. Haitch put it together for me (the plastic trays and the legs) but he didn’t want anything to do with the worms for some reason. I think he has a secret snake phobia and I’m not sure if he can actually cope with the worms. I must admit, I was a little freaked out at opening the first box of worms. I don’t know what I expected but I definitely didn’t want to open a box and be confronted with a whole bunch of worms wriggling around. Also, the box had an expiry date of the same day that I had bought them and I was a little scared of opening it and finding a whole box full of dead worms. But I bravely slit open the tape and peered into the box. Thank goodness, inside the box was a nice bag of compost with the worms all tucked neatly within. Categories: Worm farm | Tags: vermicomposting, worm farming | Permalink. Last weekend we were at a neighbourhood wild food challenge party, which we have each year. And while we were there my neighbour farmer friend had a bit of a laugh at our “posh” chicken coop that had suddenly appeared on our front lawn. So I told him the story of Hannah Hen arriving at our house looking to be adopted. Our neighbour farmer friend asked what she looked like and I told him that she was small and brown and had a coloured ring around her neck making her look like she had been crossed with a pheasant. Oh dear. He asked if she had a name and I told him it was Hannah Hen. He turned to his cute little farmer daughter and said “Brittany has a new name”. Well her little face said it all. Fear struck. Am I going to have to relinquish Hannah Hen (aka Brittany) to her rightful owner, this cute little farmer girl? Thankfully no but before you think me very cruel towards the cute little farmer girl, let me explain something. The neighbour farmer friend and his family live half a kilometre down the road from us and the land that they farm across the road. Hannah Hen (aka Brittany) has been “living off the land” on this farm for a couple of years under the their watchful eye. The neighbour farmer friend and his family noticed her missing a few months ago and wondered where she went. They wondered if she had been taken by the hawk that is ever patrolling up and down the perimeter of this farmland. That same hawk had been responsible for the deaths of the other chooks that had been living there as her companions. I saw the rabbits playing beside Hannah Hen on the front lawn today. I think she tolerates them and probably tries to control them, just like she controls Hilda Hen and Helen Hen. But oh dear, Husband Haitch went out today and bought an air rifle and on the box it says powerful enough to kill rabbits and possums. Please don’t kill the rabbits. Categories: Rabbits | Tags: Chickens, chooks. hens, rabbits | Permalink. A rat in the chicken coop! Nooooooo, I knew it had to happen but I didn’t think it would be this soon. I was in the house and I heard one of the chooks make a strange noise. I thought that maybe Hannah Hen had laid an egg so I went outside to investigate. When I got outside I saw a rat run into the woodpile at the entrance to the bush (or woods as people would say in the US). Maybe the chooks had seen the rat and were frightened. But then again I’m not sure what a chook would do if face to face with a rat. Would she be frightened? But the chooks were ok, they were sitting on their favourite perch looking non-plussed. A little later Haitch looked outside and saw the rat actually in the chicken coop eating chopped dates! (Some would say what are chopped dates doing in the chook coop!) So Haitch thought he would “deal with” this rat and crept quietly away, picked up a big rock and tip toed back to the chicken coop to throw the rock at the rat! But of course, the rat was far too clever for him. As Haitch got closer with the rock held high, the rat trotted off out of the coop and bounced into the bush. We have had rats in the compost bin before but I thought we were keeping on top of them using our bait station but obviously not. So we refilled the bait station and put it nearer the coop, hoping the rat would come back and decide the poison was tastier than the dates. Just as the chooks were putting themselves to bed, the rat came back. I happened to be watching out the window as I was waiting for the girls to go into the coop so I could shut them in for the night. They were having their last fill of grass before bedtime quite near the coop as they always do at dusk. Then they saw the rat who was quite near the bait station. It was only a few metres from the chooks and they both stopped eating and they took a few steps towards the rat. The rat froze. They took a few more steps towards him and they peered at the rat with their beady eyes. Then I think they realised he might be a threat to their food (particularly their dates, maybe) and they both ran at the rat. The rat ran off back into the bush. They looked very pleased with themselves. Hopefully he will come back tonight and have a lovely feed of bait and bring along his whole family. I had better buy some more bait and maybe a few more bait stations. I think this is going to be an ongoing battle. Categories: Rat | Tags: chicken, chicken coop, Chook, coop, hen, rat | Permalink.